In a fit of creativity/self delusion/enthusiasm this little baking blog has been born…..and coincidentally it’s being born right around when I was born! (Thursday was my birthday… 29 and counting!) and it’s hopefully going to be proof that you can teach an old dog new tricks. The aim here is to give me an incentive to learn a little more about baking, a whole heap more about blogging (as I literally knew a giant ZILCH until about a week ago) but to mainly have a little fun. I have always loved to write and to bake so surely mixing the two can only be a good thing, right? Hey, anything that keeps me off the couch, curled up with yet another book or episode of Community….. So here we are and my very first post is all about the childish side of baking! I clearly need to embrace my youth whilst I am still the happy side of 30. Sure, that fancy multi layered cake topped with figs and drenched with boozy syrup may make the adults all drool- but is it really as fun to make as ANYTHING involving sprinkles and icing? I say NO! 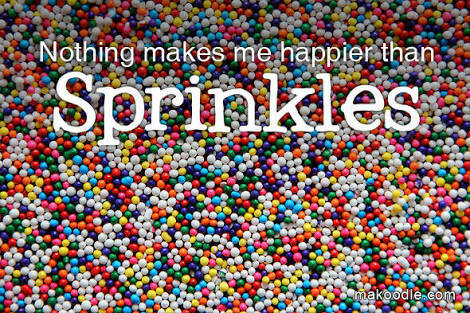 I solemnly swear to never outgrow sprinkles.. 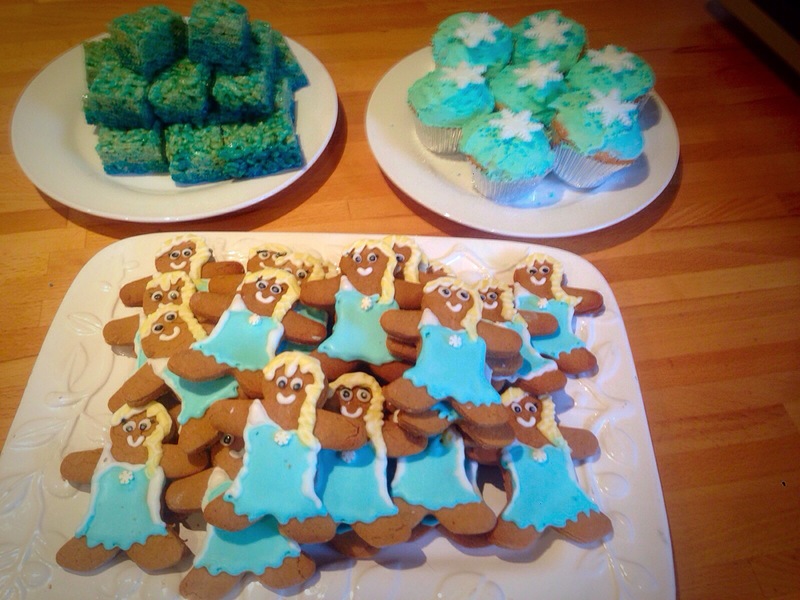 So when my niece’s 6th birthday party came up I was happy to offer a hand to make some goodies. As anyone who knows a girl under 10 will no doubt be aware, Frozen is a phase that is just not going away! So after sitting down with the little Elsa-to-be, I deciphered that anything blue and sparkly can classify as “Frozen” food…but if it was Elsa themed then that is the icing on the cake! (or cookie in this case). 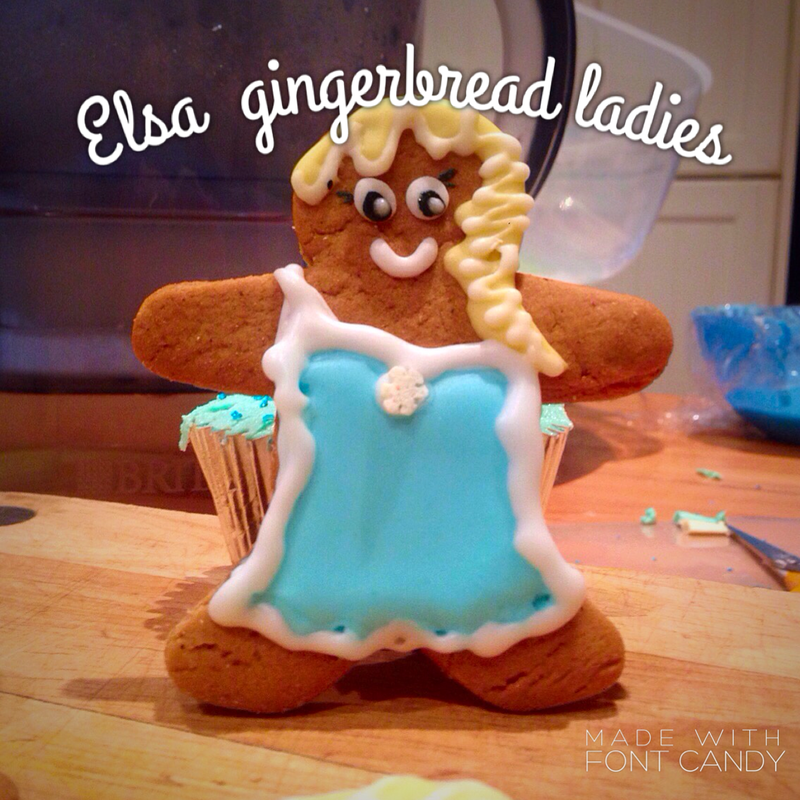 And so an idea for gingerbread Elsa’s was formed. This is just an easy variation on your basic gingerbread recipe, tweaked in the decorations to be on trend and a hit at your Frozen party. Use an electric beater (or some really good muscles) to beat the butter and sugar in a bowl until pale and creamy. Add the golden syrup and egg yolk and beat until combined. Stir in the flour, ginger, mixed spice and bicarbonate of soda. 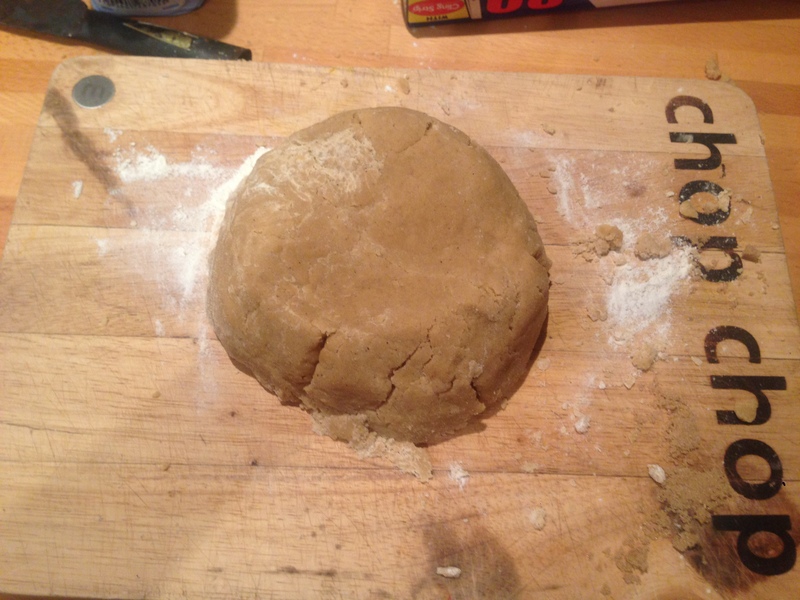 Turn onto a lightly floured surface and knead until smooth. Press dough into a disc. Cover with plastic wrap and place in the fridge for 30+ minutes to rest. This step is important to reduce spreading of the dough when baking- don’t skip and you will be rewarding with firm cookie shapes! Follow your packet ingredients or the recipe in the link below to make up the royal icing. Split into three bowls, roughly 1/4 for yellow, 1/4 for staying white and 1/2 to be dyed blue. When coloring your icing, just remember- easy does it with the food dye. Adding the dye with a skewer works best for me, allowing a restrained amount to be added so you can really control your icing tone. I personally used this royal icing recipe which has meringue powder instead of eggs- meringue powder is an American product and pretty pricey to buy so us Aussies can use the super handy Pavlova Magic eggs as a substitute! Place the chilled dough between 2 sheets of baking paper and roll out until about 4mm thick. 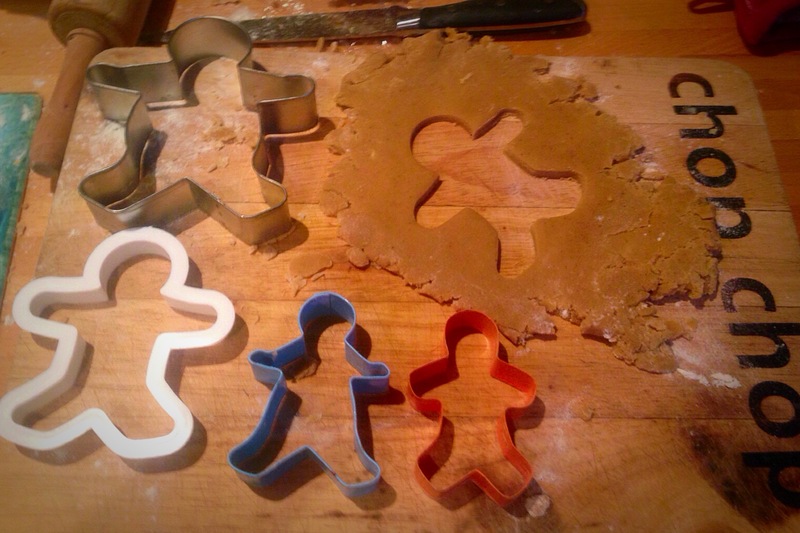 Use a gingerbread man or lady cutter to cut out shapes- whatever size you wish. The size will of course determine how big your gingerbread army is! Place on trays about 3cm apart. Repeat with any excess dough. 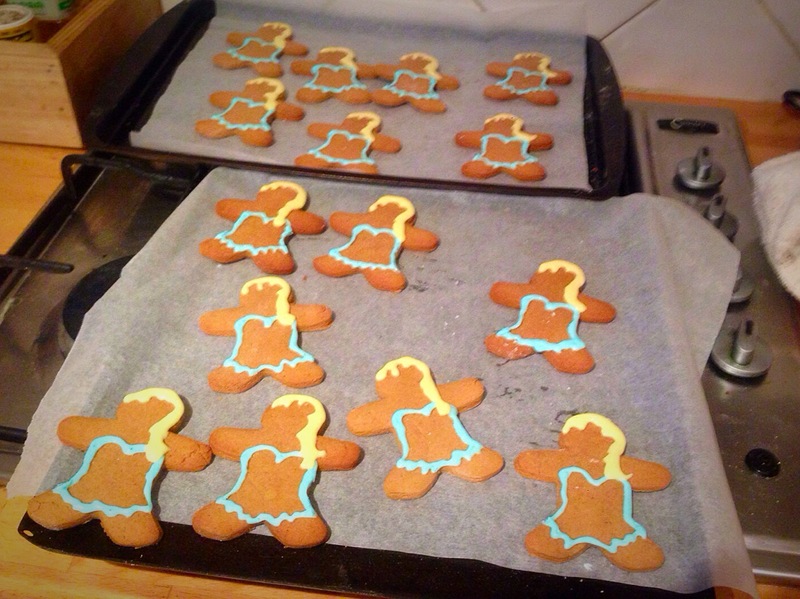 So many gingerbread cutters but not a dress in sight..
Bake in oven for 10 minutes or until brown. Remove from oven and transfer to a rack to cool completely before icing. Place prepared icings in piping bags (or the poor mans substitute which I used, zip lock bags with the corner snipped off). Pipe icing over gingerbread Elsa’s to decorate. Be as creative as you like here but for mine I piped the outline for Elsa’s blue dress with my blue icing before watering down the blue icing to flooding consistency (think shampoo) and flooding within the dried outline. White detailing was added to her cape and sleeve. For her hair, I piped the outline of her hair in the pale yellow, then outlining her braid with the white icing once the yellow was fully dry. The eyes were just fondant shaped into little eye balls and pressed on, before detailing the eyes with black food coloring.